Israel has a technologically advanced market economy that depends on imports of crude oil, grains, raw materials and military equipment. Recent natural gas discoveries off the coast of Israel have been a positive development for the country which, otherwise, has limited natural resources. Israel also has intensively developed its agricultural and industrial sectors over the past 20 years. 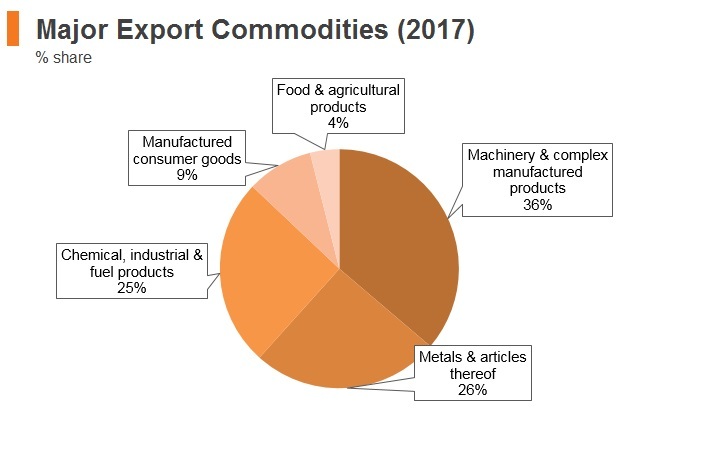 Cut diamonds, high-technology equipment and agricultural products (fruits and vegetables) are the leading exports. Economic growth in the medium term will receive support from strong domestic demand and an export rebound. 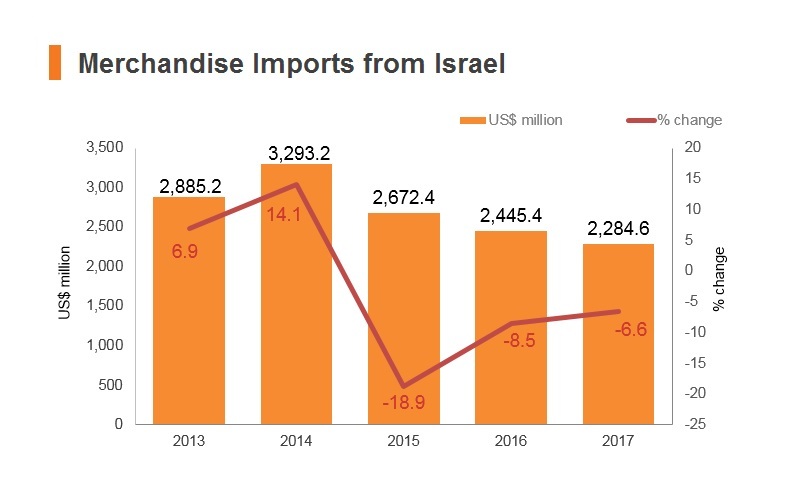 Over the long term, Israel's trade deficit is likely to narrow noticeably as rising gas exports from the Leviathan field come online. The United States agreed on a military aid package worth USD38 billion over next 10 years for Israel, the largest such deal in the United States history. Parliament passed a law which retroactively legalised dozens of Jewish settlements built on private Palestinian land in the West Bank. Work began on the first new Jewish settlement in the West Bank for 25 years. UN and Egypt attempted to broker a long-term ceasefire between Israel and Hamas amid an upsurge in violence on the Gaza border from March. Israel has been a member of the World Trade Organization (WTO) since April 21, 1995 and a member of the General Agreement on Tariffs and Trade (GATT) since July 5, 1962. The average import tariff rate in Israel is 1.0%. This rate is among the lowest in the world and is indicative of the country's welcoming environment for international trade. Exports of goods and certain services and various other transactions are zero rated and certain transactions are exempt. Banks and other financial institutions pay value added tax (VAT) equivalent taxes at a rate of 17% based on their total payroll and profits. Non-profit organisations pay VAT-equivalent tax (wage tax) at a rate of 7.5% of their total payroll. Israel's WTO tariff schedule indicates higher rates for agricultural products but relatively low rates for intermediate inputs. 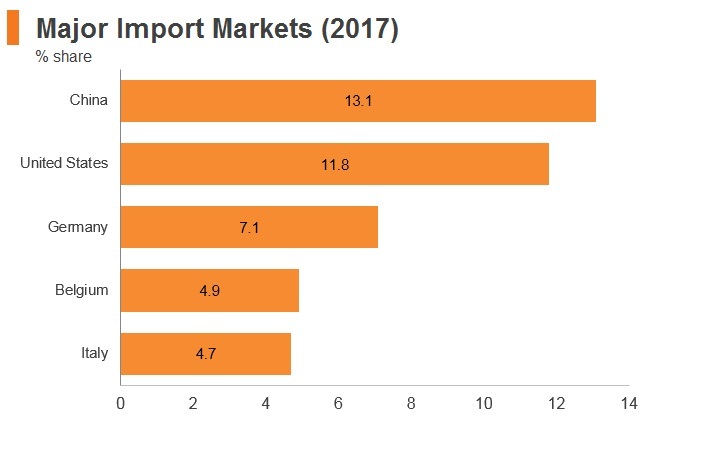 Most of Israel's main trade partners, including the United States and the European Union (EU), are covered by free trade agreements (FTAs) which have eliminated the vast majority of tariffs. Trade relationships with major partners are reinforced by Israel's wide range of FTAs, with agreements in place with the EU, the United States, European Free Trade Association (EFTA), Mexico, Turkey, Canada, Jordan, Egypt, Colombia and the Mercosur bloc of South American countries. These agreements assist with the diversification of trade partners, which is also being pioneered by the Israeli government through the opening of new trade offices in Chile and Peru and visits by Prime Minister Benjamin Netanyahu to a number of East African and Central Asian countries. Customs duty is imposed on certain products imported into Israel. The rates of duty depend on their classification according to the Harmonised Customs Tariff and the country of origin. Israel imposes excise taxes on a variety of goods (such as gasoline and diesel fuel used for transportation, tobacco and alcohol). The excise taxes are levied item-by-item and the rates vary. Most goods can be freely imported into Israel, though licences are required for defence-related items. When applying for an import licence, the importer must either be an Israeli resident, a corporation or a non-profit organisation registered in Israel. Israel's import tariffs are classified under the Harmonised System (HS) codes. Ad valorem duties are imposed on imports' transaction value (declared by importers). On top of custom duties, a VAT is applied to almost all imported and domestically produced goods and services. For imports, VAT is levied based on the cost, insurance and freight (CIF) value plus custom duties. The minister of finance has increased the VAT to 18% since June 2013. Israel maintains strict regulations on product labelling and country of origin marking. All imports into Israel must have a label showing the country of origin, the name and address of the manufacturer, the name and address of the Israeli importer and the contents, weight and volume in metric units. All labels must be in Hebrew. English may be added and the printed letters must not be larger than those in Hebrew. Customs procedures are streamlined and do not require excessive documentation or lengthy delays, while the risk of businesses being solicited for bribes by customs officials is low. There are few additional non-tariff trade barriers as the government is committed to supporting free trade. The Israeli government is pursuing an FTA with India. 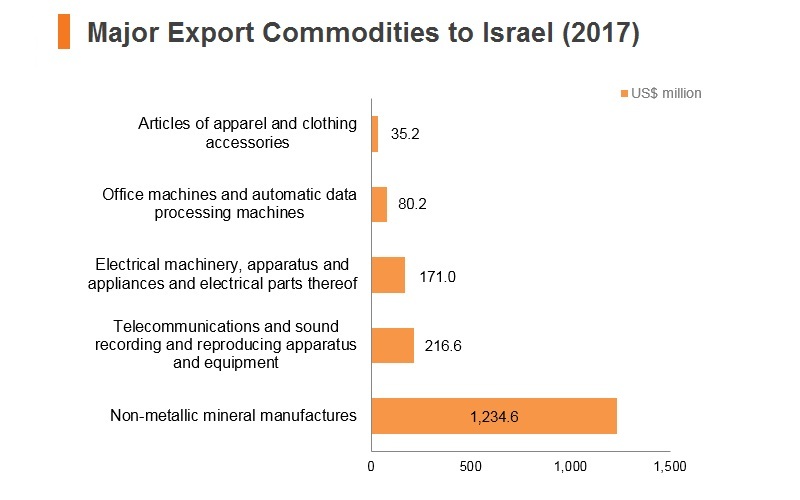 United States-Israel FTA: The United States is Israel's single largest export partner and second-largest import partner, a situation which has been encouraged by the FTA between the two countries. This trade pact was established in 1985 to lower trade barriers in some goods. The agreement reduces rates of duty and, in some case, eliminates all duties on merchandise exported from Israel to the United States. The agreement also covers merchandise exported from Israel, the Gaza Strip and the West Bank. This pact confers major advantages on Israeli businesses, which are able to access the United States market with negligible tariff or non-tariff barriers. Israel-EU FTA: The legal basis for EU trade relations with Israel is the EU-Israel Association Agreement, which entered into force in June 2000. The aim of this agreement is to provide an appropriate framework for political dialogue and economic cooperation between the EU and Israel. Trade between the EU and Israel is substantial and some of the country's main trade partners, including Germany, Belgium and Italy, are members of the bloc. Israel-EFTA FTA: Israel has an FTA with members of the EFTA that includes Iceland, Liechtenstein, Norway and Switzerland. Israel-Turkey FTA: Turkey is an important trade partner and the two countries are seeking to boost economic ties. Sometimes fractious relations between the two countries have limited potential trade, but energy links are being mooted as Israel plans to exploit its offshore natural gas fields. Mercosur-Israel FTA: Mercosur (Southern Common Market), consists of Argentina, Brazil, Paraguay and Uruguay. The Israeli government is attempting to boost trade ties with Latin America as part of its diversification efforts to reduce reliance on the United States and EU markets. However, trade between Israel and Latin American countries remains relatively low at present. Israel-Canada FTA: In 2014, Canada and Israel agreed to modernise the Canada-Israel Free Trade Agreement (CIFTA), a goods-only agreement in force since January 1, 1997. A modernised CIFTA will improve access to the Israeli market for Canadian companies through further elimination and reduction of tariffs on agricultural and fisheries products. With the inclusion of new progressive elements on gender, small- and medium-sized enterprises and corporate social responsibility, as well as labour and environmental protections, the modernised CIFTA will signal the importance of progressive trade and ensuring that the benefits and opportunities that flow from trade and investment are more widely shared. Israel-Jordan Preferential Trade Agreement: A bilateral agreement exist between Israel and Jordan, which aims to boost economic ties between Israel and the Arab state with which it has established diplomatic relations. 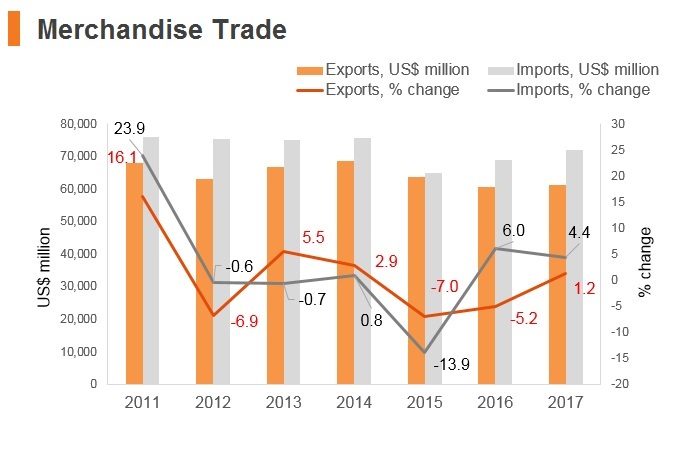 Nevertheless, trade flows between the two countries remain limited at present. Israel-India FTA: An FTA with India is being negotiated. 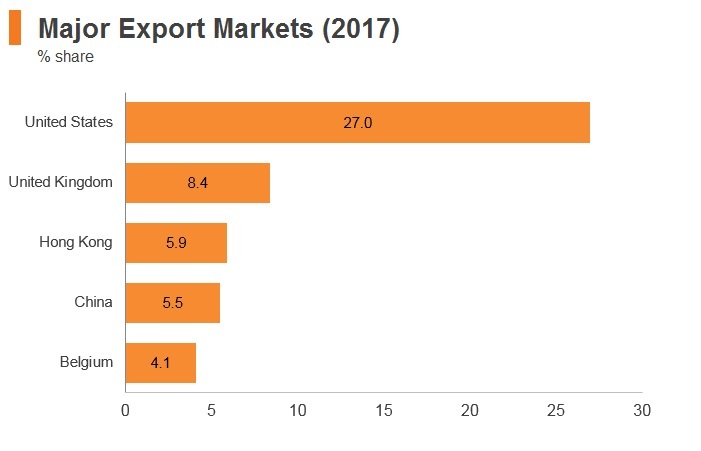 In 2017, India was Israel’s seventh largest export partner and ninth largest import partner. The bulk of products traded between the two countries are natural or cultured pearls, precious or semi-precious stones and precious metals. A future FTA between the two countries is expected to boost such trade further. The Israeli government aims to foster supportive conditions for companies looking for business opportunities in the country. 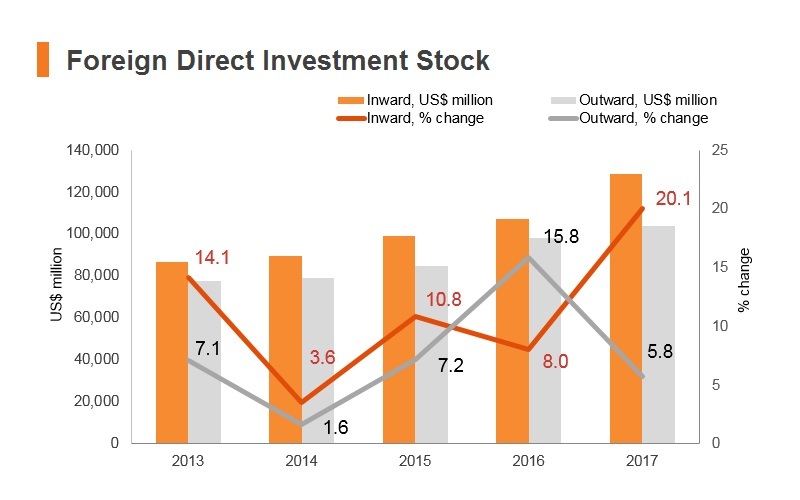 To promote foreign direct investment (FDI), the government has set up Invest in Israel, an investment promotion centre under the Ministry of Economy to aid investment growth across Israel's industries. 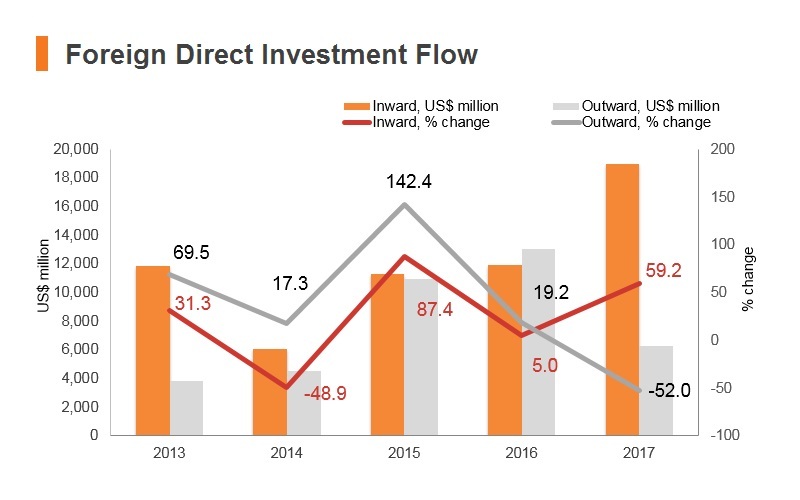 A wide range of incentives and benefits are offered to investors in industry, tourism and real estate, while special focus is given to high-tech companies and research and development (R&D) activities. Investment incentives, outlined under the Law for the Encouragement of Capital Investment, are divided into two main parts: the grants programme and the automatic tax benefits programme. Israel is actively promoting cooperation with China and other parties under the Belt and Road Initiative, welcoming Chinese enterprises to participate in various infrastructure projects in Israel, as the latter is attempting to add sea ports and new railroad networks. China Harbour is building a new port next to Ashdod’s existing one, and the Shanghai International Port Group (SIPG) has won a 25-year licence to operate another deep-sea private port planned in Haifa. It is reported that Israel would like China to participate in the building of a railroad connection between the ports in Eilat and Ashdod, connecting the Red Sea to the Mediterranean Sea. Government procurement laws require foreign companies to offset any foreign goods or services provided by investing in local production, entering partnerships with local companies, or sourcing goods and services from domestic firms. Offset requirements can vary from 20%-50% of the value of the contract. This can raise the costs associated with participating in government contracts, and deter foreign firms from applying for tenders. The Israeli government encourages investment by offering a wide range of incentives to investors under The Law for the Encouragement of Capital Investment. To meet the qualifying standard for these incentives a company must be internationally competitive, although the scheme favours high-tech and R&D industries. 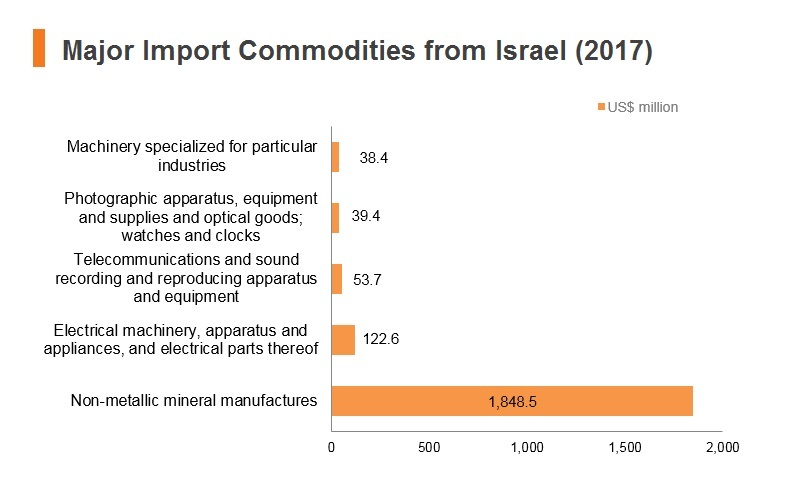 These incentives include grants for industrial enterprises with export capabilities and operating in a designated National Priority Region (mostly in Israel's north and south). Simultaneously, Priority Enterprises and Special Priority Enterprises established in the same National Priority Regions can avail themselves of reduced corporate tax rates of 9% and 5% respectively. 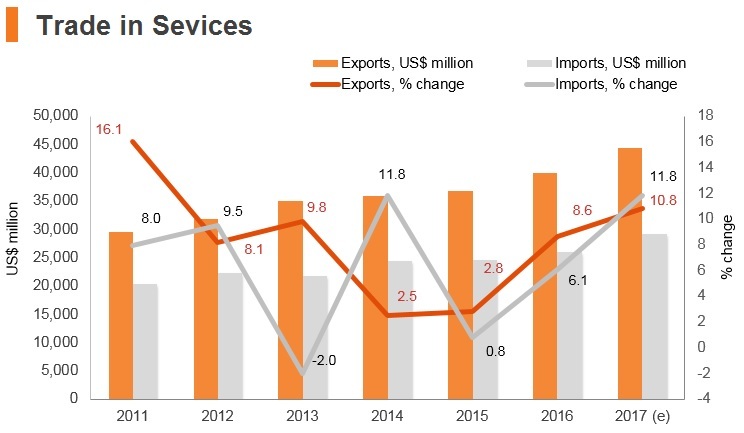 In addition, the Office of the Chief Scientist of the Ministry of Industry and Trade operates a range of support programmes, on a yearly budget of USD300 million. Capital gains on real estate are subject to the Land Appreciation Tax Law. The law relates to any real estate in Israel, including houses, buildings and anything permanently fixed to land, real estate rights and leases for 25 years or more. Tax calculations closely follow the calculation of corporate tax on capital gains. In order to promote foreign investment in the Israeli corporate bonds market, there is an exemption from tax with respect to interest income received by foreign investors on their commercial investments in Israeli corporate bonds traded on the Tel Aviv Stock Exchange (TASE). The exemption is not granted to a foreign investor which has a private equity firm in Israel or is related to, or holds 10% more of the means of control in, the investee company. In addition, in order for the exemption to apply to a foreign investor that has 'special relations' with the investee company, regularly sells products to or provides services to the investee company, or is employed by the investee company, the investor must prove that the interest rate on the corporate bond was determined in good faith. Preferred Enterprise regime status, which provides for cash and tax benefits, may be granted under the Law of Encouragement of Capital Investments to enterprises that meet relevant criteria. In general, the law provides that projects are considered 'preferred' if the enterprise will contribute to the development of the productive capacity of the economy, absorption of immigrants, creation of employment opportunities, or improvement in the balance of payments. The Special Preferred Enterprise (SPFE) regime is intended for very large companies with material investments in productive assets, R&D, or in providing new employment opportunities. A company must demonstrate that it will greatly contribute to the Israeli economy to qualify for the SPFE regime. To qualify, an Israeli company must meet certain conditions, such as having SPFE annual revenue greater than or equal to ILS1 billion and being part of a group of companies that generates annual revenues greater than or equal to ILS10 billion in the same industrial sector in which the Israeli company operates. 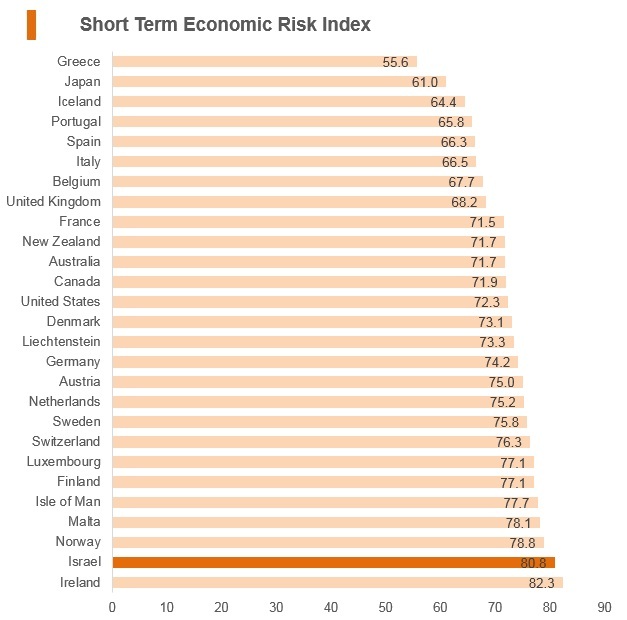 There are generally few regulatory barriers to investment in Israel and the government adopts a consistently welcoming approach to FDI in almost all sectors of the economy. Among the few existing restrictions is foreign investment in parts of the defence industry, which is off-limits for national security reasons, while FDI in regulated industries such as banking and insurance require government approval. 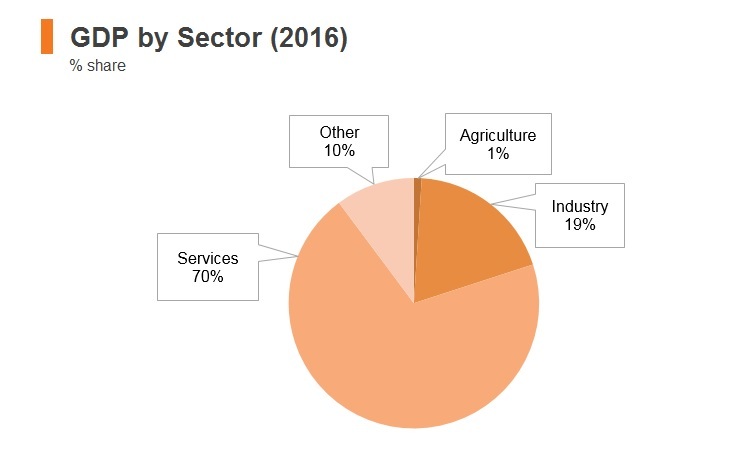 In addition, some key industries including transport and utilities remain dominated by state-owned enterprises, which hold monopolies in electricity generation and distribution, port operation, aerospace, railways and energy. Port of Eilat free trade zone (FTZ) The FTZ located at the Red Sea port of Eilat offers exemption from customs duties and trade tariffs, as well as tax exemption. Office of the Chief Scientist of the Ministry of Industry and Trade support programmes Israel operates around 30 industrial parks and areas, as well as a cross-border zone with Jordan. This is a novel enterprise and aims to fulfil Jordan's requirements for Qualified Industrial Zones (QIZ). 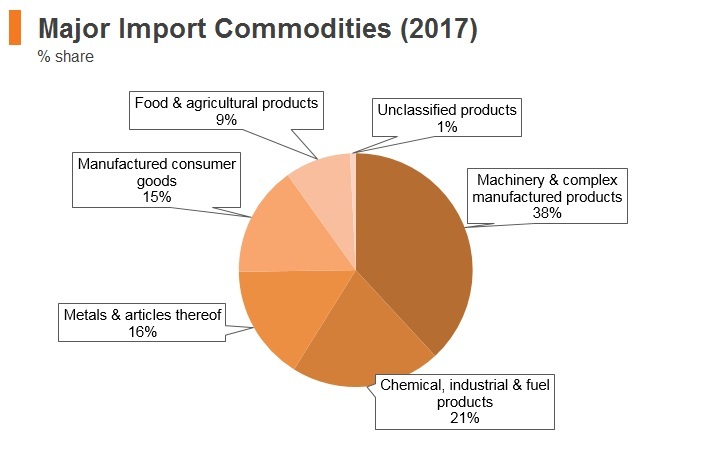 The QIZ scheme is a United States initiative, whereby goods exported from certain areas in Jordan and Egypt are exempt from the United States tariffs, provided they contain at least 8% Israeli input. As of January 1, 2018, the standard corporate income tax rate was lowered from 24% to 23%, following a reduction the previous year which had brought it down from 25%. This lower tax rate reduces operational costs for businesses and aims to encourage growth and competitiveness in Israeli industry. 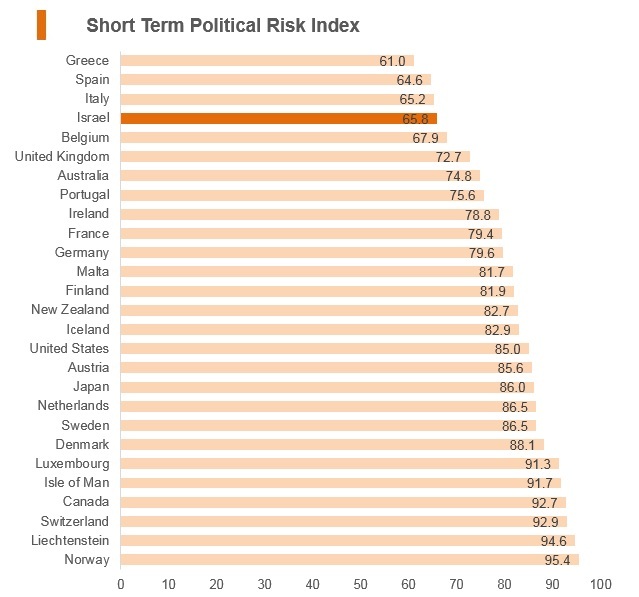 Nevertheless, the tax burden on businesses remains higher than that experienced in Gulf Cooperation Council states, where no corporate income tax is charged. VAT is added to the payments on most goods and services, including imports. 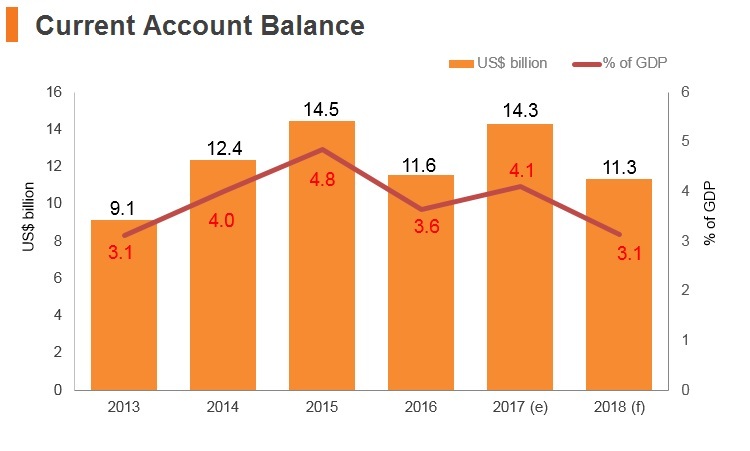 VAT is charged at a flat rate of 17%, having been reduced from 18% in 2015, but certain items are zero-rated including exported goods, provision of tourist services, the sale of fruit and vegetables and on cargo transport to and from Israel. VAT is also zero-rated on the sale of goods and services to the Eilat FTZ in the south of the country. Businesses with annual revenues of less than USD20,000 are usually exempt from VAT. - Dividends between Israeli resident companies are generally exempt from Israeli tax. - Dividends paid from a foreign resident company received via an Israeli payer are subject to withholding tax at a rate of 24% when paid to an Israeli resident company and at a rate of 25% when paid to an individual. - The 30% rate applies in the case of a ‘substantial shareholder’, which is, in general, a shareholder that holds 10% or more of the rights of the company. A notable risk to businesses in Israel that need to employ foreign staff is the difficulty of obtaining foreign worker visas. Although any Jewish person wishing to live and work in Israel is eligible to apply for a right of return visa, all other foreign workers must apply for a B-1 visa and are subject to the provisions laid out by the ministry. The candidate must be sponsored by a business and can only work for that organisation while domiciled in Israel. An applicant and his or her employer can apply for a work permit valid for two years, one year, three months or 45 days. As part of the process a candidate must first receive a recommendation from the Ministry of Interior to work in Israel. This requires convincing the ministry that the employee is an expert in their field, earning more than twice the average salary in the market and proving no available Israeli citizen can perform the same task. The application process usually takes up to 90 days, and the cost stands at USD2,925. Most business travellers can enter Israel visa-free with a right to stay in the country for three months. Nationals of some Muslim-majority countries in the Middle East, North Africa and Asia require confirmation from the Israeli government before travel, but this should not cause major delays. Israel has visa exemption agreements with many jurisdictions. Tourist visa exemption applies to national and official passports only, and not to other travel documents. Citizens of some jurisdictions, including Hong Kong, are exempt from obtaining transit and class B2 visit visas. 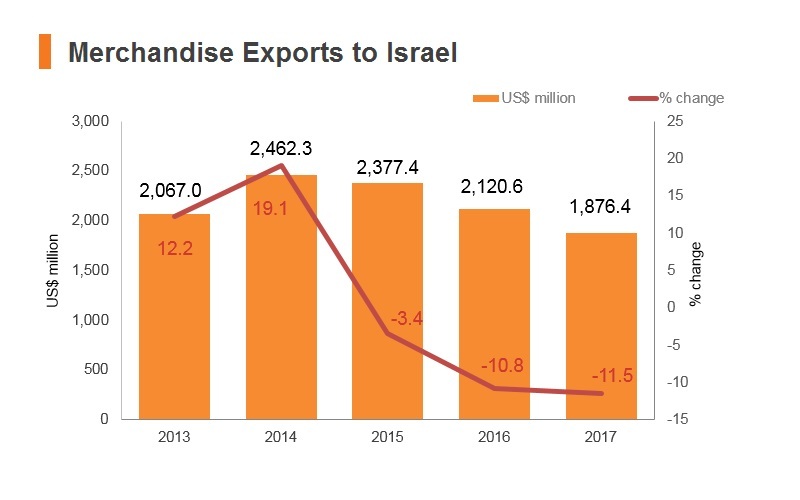 The export sector in Israel makes up around 30% of GDP; a further strengthening of the shekel can thus impact the country's economic output significantly. The Bank of Israel has mitigated appreciatory pressures on the shekel by strongly intervening on the foreign exchange markets. 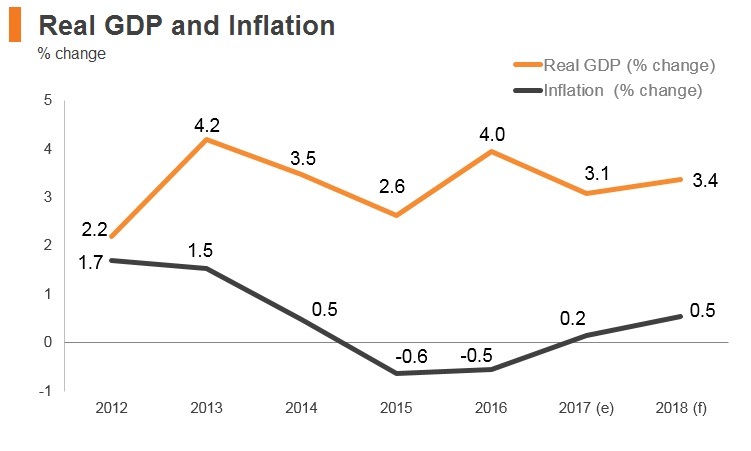 From the second half of 2018 through to 2019, robust domestic demand should keep economic momentum afloat. 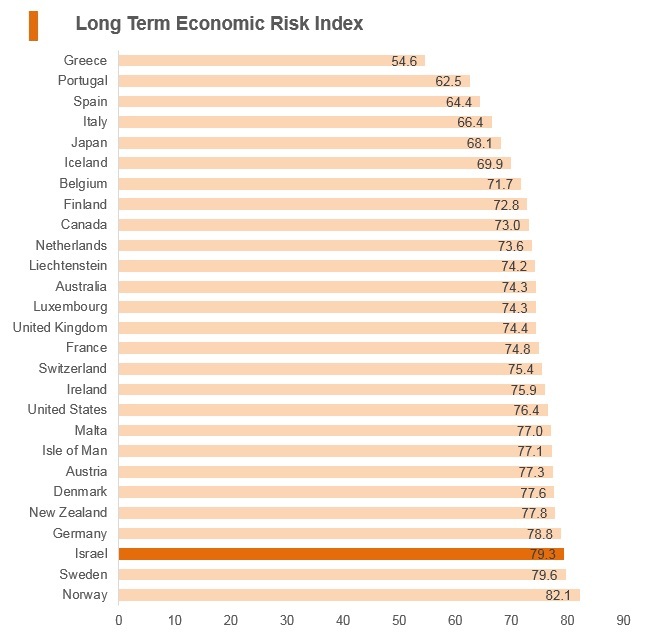 A lower tax burden and still favourable financial conditions should support private consumption. Meanwhile, new gas- and oil-related projects will likely buttress fixed investment. 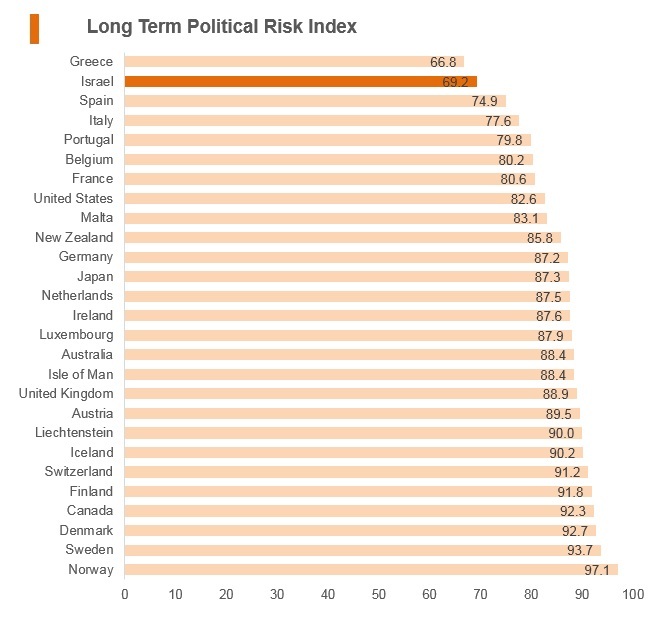 However, regional tensions remain a downside risk to the outlook. 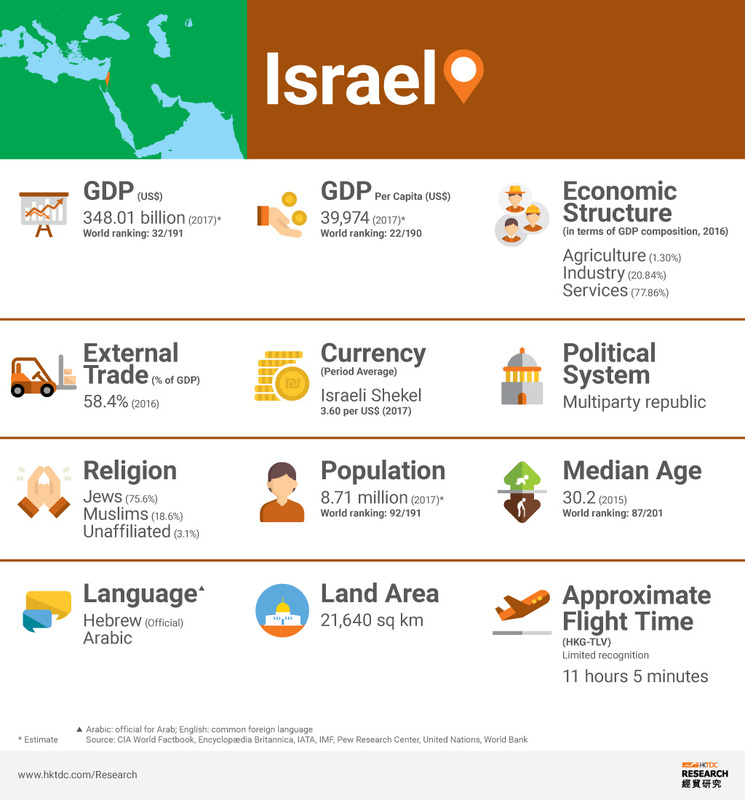 Israel possesses many qualities which make it an attractive destination for investment, particularly among its direct neighbours in the Middle East. 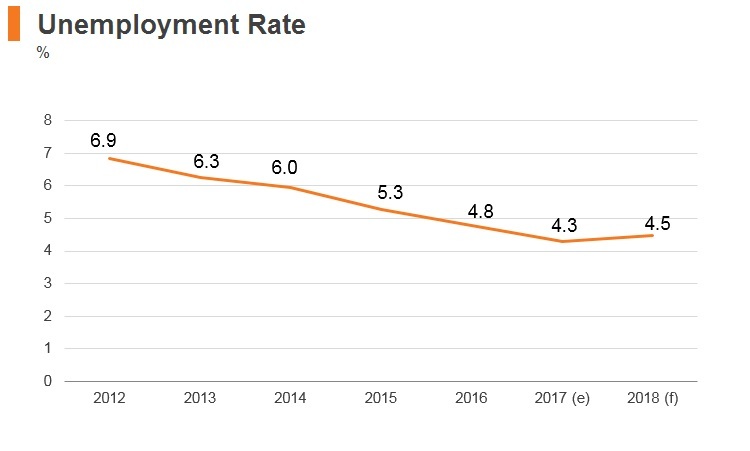 The country's open market, few investment restrictions, well-educated labour force and developed logistics network create the necessary conditions for private enterprises to thrive. The primary concern for investors is the security situation, which poses risks to the safety of personnel and assets, but the development of a comprehensive defence apparatus has made Israel one of the more secure countries in the Middle East. Israel has concluded a double taxation agreement (DTA) with mainland China, which was signed on October 13, 2016. Hong Kong has concluded airline income treaties with Israel. Israel has a Bilateral Investment Treaty with mainland China that entered into force on January 13, 2009. Hong Kong SAR passport holders travelling to Israel have visa-free access or visa-on-arrival for a duration of stay of up to three months.